"PORT BAKU MALL", covers an area of 32,000 square meters, and provides the city's largest shopping center to date. Meeting the highest international standards, the shopping mall "PORT BAKU" represents luxury brands. On 25th of September 2014 year, Port Baku Mall, the largest shopping center in the city opened its doors to visitors. A lot of new brands are introduced on the three-store complex with the total area of 32.000 sq.m. Here you can find most popular and coveted brands and enjoy the gastronomic delights of tenant cafeteria and restaurants. It is the new level of service exclusive not only for Baku, but also within entire Caucasus. 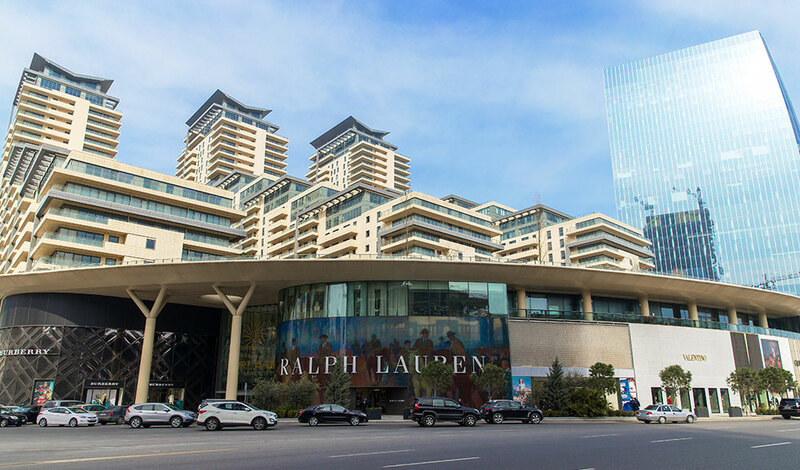 Shops of famous designer brands such as Ralph Lauren, Giorgio Armani, Valentino, Alexander McQueen, Burberry, Givenchy, Dsquared2, Chloe, Stella McCartney, Balenciaga, Marni, Emilio Pucci, Bally, Jimmy Choo, Tory Burch, Hugo Boss located on the ground floor of the mall. Jewelry boutiques represented by famous brands such as Tiffany&Co, IWC, Louvre, Frey Wille and Scavia. The second floor occupied by another famous brands — RED Valentino, Weekend MaxMara, Marc by Marc Jacobs, Marciano Guess, MAX&Co, Diesel, as well as Massimo Dutti, Ted Baker, Banana Republic, etc. The, third floor given to the kids' favorite brands including Next, Mothercare, Chicco, Okaidi, Jacadi, Brums and Petit Bateau. Gourmet special service is also provided in famous parisian Dalloyau, Laduree, and there is a chance for shopping at the Port Baku Bazar, or to spend time in Baccanale or The House Cafe restaurants. The central part of the Port Baku is taken by the Emporium multi-brand store, which total area makes 10.000 square meters, where all the 3 floors are occupied by more than 300 of the most actual brands of ready-to-wear, accessories, underwear, perfume, cosmetics etc. Emporium is highly developing day by day, and every next step raises the bar for the whole sphere. The new store became a center of trends, fashion, beauty and style; it takes attention of those who want to be at the edge of the progress. Port Baku Mall is a part of the Port Baku complex that also includes Port Baku Residence and Port Baku Towers business area. We do have leading Banks ATM’s on each floor of the mall. You can find the customer service desk on Ground Floor near the Mall entrance. You can ask customer service desk for any help on lost & found items. There are baby-changing facilities on Ground Floor and Level 1.